Welcome back to Something About Coins! 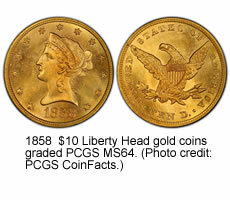 A collection of $10 Liberty Head gold coins, ranked number one Finest Set of All Time on the PCGS Set Registry, makes headlines following a recent sale. Dave Harper comments on the U.S. Mint sales of proof and uncirculated American Eagles, and Vic Bozarth discusses buying and selling coins from auction houses. Eliza Johnson First Spouse Gold Coins are available from the U.S. Mint. Enjoy!